Brotherhood of the Darkness is recruiting! 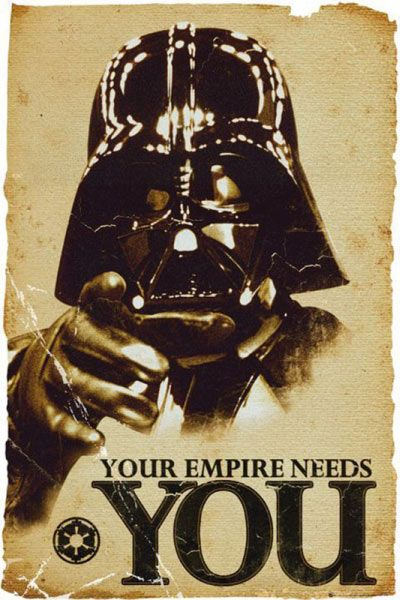 Looking for HPIT, HAAT, HST, TB and TW focused players with a minimum GP of 1.5m, who are ready to compete with a very active and friendly, fun guild. The Nightsisters with Attitude are looking to take on at least 5 players after this current TW, we would like to take a group of like minded players to join our ranks or a group to merge with us (officer roles could be available if interested). 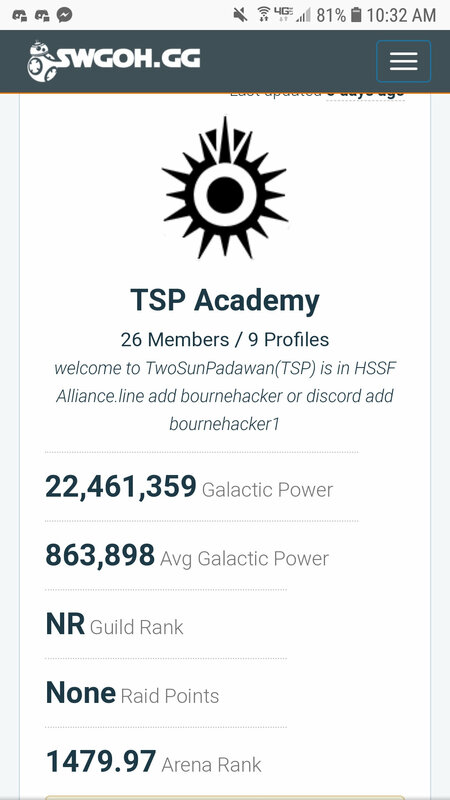 We are close to 50m gp and are TW and TB focused although we do HPIT 3x a week and HAAT 2x a week, we are at T5 sith atm. We like members to do 500, most do 600 but its not strict as long as we can get enough to do the raids, we all want to progress but we like our members to do it how they want to so there is no interference from me or the officers telling any player what to farm, we can provide advice if needed and we have discord for chat about the game. So if you have a small group of players who will participate fully in TW and TB then send me a message, you can get me on discord majolnirg23#1170 or in game ally me 471-413-535 or just message me through the forum to have a chat and further details. We are a very active guild with 6 spots open. We do not require players to spend money, and we do not have a minimum level to join. We just ask that you are active. We have plenty of heavy hitters to get through the raids so everyone gets rewards. We love star wars and enjoy playing the game together. We hope you will join us and enjoy the game as well with us. Canadians Reunited is looking to bolster its ranks! We're a laid-back but competitive guild looking for a group of up to 8 new members. You don't need to be Canadian to join. We're based in the Eastern Time Zone (ET) / UTC - 05:00, but have members from across North America and even a couple based outside North America. We're currently at about 95M (43/50) GP. Territory Wars: Our current record is 46-6. All we ask is for those who do sign up to make sure they participate both on offence and defence. Territory Battles: We have solid participation but are looking for more. We hit about 30* on average, LS and DS - more members will bring this up. Discord: We have a discord setup with lots of great info on it. Highly recommended but not mandatory. We give everyone the freedom to focus on the rosters and teams they want, although we're always happy to help those who ask for it. We offer a friendly, supportive, drama-free environment! We ask that your roster be at least 1.5M GP, and ideally more. Our top players are in the 3M range. While we don't put any pressure on members, we do expect people to be active enough. Our Heroic Pit raids happen as tickets are available, have a 24-hour join period, start at 10pm ET, and tend to last about 20 minutes. Some of us solo the raid in under 10 minutes but we ask people to hold for a bit so that more people can get damage in. Our Heroic AAT raids happen as tickets are available, have a 24-hour join period, start at 9pm ET, and tend to last about 60 - 90 minutes. Our regular Sith Raid is currently Tier 6 and we are working towards Heroic. Raids happen as tickets are available and last a couple of days. You can check out most of our top members at https://swgoh.gg/g/20528/canadians-reunited/. Active guild looking for 5-8 peeps. Laid back guild. Discord. Looking for a few to push us over in HSith. Looking for at least 8-10M package of peeps. Looking to fill our ranks. Began just a few weeks ago and only 5 spots open. We have room for a small merge of up to 5 players. We are looking a small group of people love the game and love to progress. We can take up to 13 people currently! We are asking that you have at least 2(preferably 3) strong HSR teams! JTR, Chex mix, NS, Jedi. Not everyone has to be HSR ready but we are asking that the majority of yall are. We are trying to fill up so we don't need to use mercs anymore in the HSR! 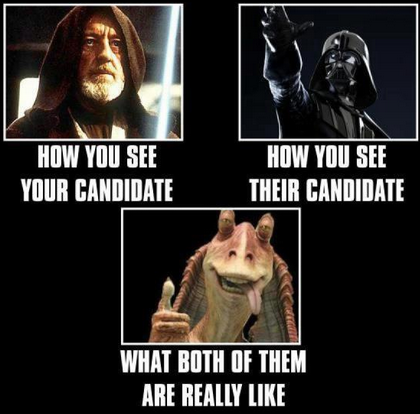 Only interested in elite players who are looking to farm heroic sith. Provide ally codes, and discord names. OpressSavage is a dedicated and organized guild that still prides itself in being casual. HPIT and HAAT on farm (auto launch with a 24 hour join period). Were currently alternating between Tiers 5&6 of the Sith Raid, but looking to shortly move up to Tier 6 full time. Currently recruiting 8-10 active people or looking to absorb a smaller guild and merge into a community. Please reach out if you have any questions. We look forward to hearing from you! They saw that doing nothing is impossible, but I do nothing every day. We are a friendly FTP guild currently looking to merge with another guild of around 12-15 good players to fill our numbers. Apologies, no longer able to accept mergers. Currently recruiting 8-10 active people or looking to absorb a smaller guild and merge into a community. Additionally, we’re also interested in joining an alliance or being absorbed into a larger group. Please reach out if you have any questions. We look forward to hearing from you! We found a guild to merge with and now are a part of the Shades of the Fallen alliance! 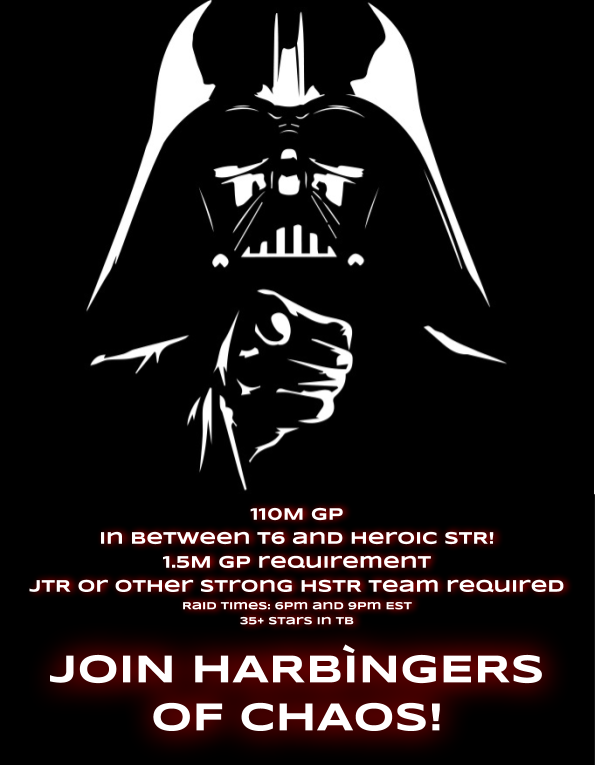 Harbingers of Chaos is looking for 10-20 players to do a last push toward heroic sith raid. We are currently farming T6 and can reach P3 of Heroic. Contact me on discord Hemejef#7499. Join Me and Win is looking for 5 to put HSTR on farm. We have completed 3 of our last 4 attempts. Do you have at least 2 strong HSTR teams ready? Join me and win those traya shards! Are you an HSTR master? Join me and win top 10 consistently and get those sweet g12+ rewards! We are currently in an alliance of 7 guilds, and we are the development guild. As we've grown, our high-level players are moving up to the other alliance guilds, and we are looking for 15 to 20 people to replace them. If your guild members meet the following requirements, feel free to join the discord chat listed below. We are a good group, so don't be shy. We will be getting new officers as well, if that interests you. 500 tickets a day, level 85. Looking for 24 people to join tsp. We are a casual guild looking for casual players if you have any questions feel free to ask thank you. 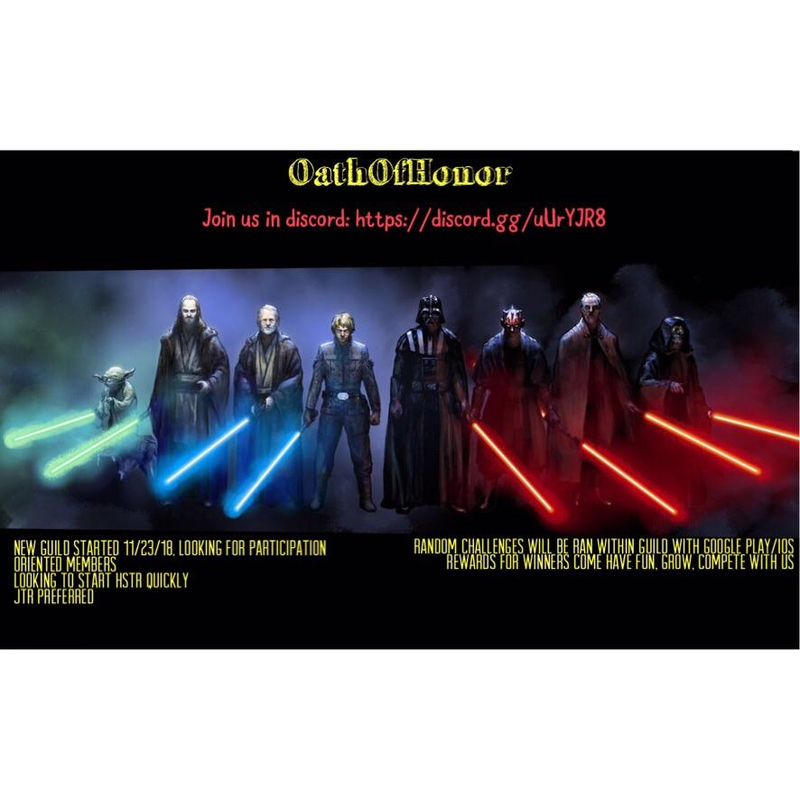 OathOfHonor is 94m gp guild running Haat, Hpit, t6 sith(when spots fill will do hsth). We need 8 new guildies who want to be family and want to win TW, defeat HSth, and dominate Grand Arena. We have US and UK, we set times to fit all. We have 8 up to 12 spots open if you or a group are interested please contact me on discord at SkiaRyder#6619 or in game at ally code 551 538 992. Guilde francophone à 100 Millions de puissance recherche une dizaine de membres pour avoir le petit déclic manquant pour aborder le raid sith héroique. Il n'y a pas de règle de tickets minimums, etc... Nous avons tous une vie et des activités autres, donc nous respectons la liberté de chacun dans une ambiance détendue et bon enfant. Il n'y a que 2 exigences, être présent sur discord afin de coordonner correctement les efforts pour le raid sith. Avoir minimum 1,5 Millions de puissance (si 1 ou 2 membres sur les 10 sont un peu faibles, ça passe. On les guidera avec plaisir). Rednines (95 million galactic power) are looking to add 5 to 10 people to the roster. Requirements are 2 million gp + and the ability to be active for tb, tw, raids, etc. We are a guild that is catered towards adults and have a very nice core of star wars loving members. If you think you fit the description, send me a dm on the forums. You can also contact me in game (ally code: 322-183-482) or on discord (Apocrius#8112). Thanks for listening.